Incisional hernias (IH) after orthotopic liver transplant (OLT) are challenging due to their concurrent midline and subcostal defects adjacent to bony prominences in the context of lifelong immunosuppression. To date, no studies evaluated the posterior component separation with transversus abdominis release (TAR) to repair complex IH after OLT. We aim to report the outcomes of TAR in this scenario. OLT patients who underwent open, elective IH repair with TAR performed at two centers and with a minimum of 1-year follow-up were identified in the Americas Hernia Society Quality Collaborative (AHSQC). Outcomes included 30-day surgical site infections (SSI), surgical site occurrences requiring procedural intervention (SSOPI), unplanned readmissions, reoperations, and hernia recurrence. Forty-four patients were identified (mean age 60 ± 8, 75% male, median BMI 30.7 kg/m2) at two centers. Median hernia width was 20 cm [IQR 15–28] and 98% (43) were clean cases. Retromuscular synthetic mesh was used in all cases, and 93% (41) achieved fascial closure with no intraoperative complications. Postoperatively, there were 5 SSIs (4 deep, 1 superficial), 6 SSOPIs (4 wound opening, 1 debridement, 1 seroma drainage), four (9%) readmissions, and 3 (7%) reoperations. One patient developed a mesh infection that did not require mesh excision. After a median follow-up of 13 months [IQR 12–17], there were 11 (25%) recurrences; 8 due to central mesh fractures (CMF). Seven recurrences have been repaired either laparoscopically or using an onlay. In a challenging cohort of immunosuppressed patients with large IH, TAR was shown to have acceptable medium-term results, but high recurrence rate driven by CMF. Further studies investigating the mechanism of central mesh fractures are necessary to reduce these recurrences. The outcomes of orthotopic liver transplant (OLT) have dramatically improved due to the noted success of high-volume centers and the advent of modern immunosuppressant medications [1, 2, 3]. Consequently, perioperative survival rates have increased and it is now estimated that 80% of OLT patients will be alive 3 years after their operation . With the growing number of successful OLT patients, general surgeons are seeing more long-term complications like incisional hernias (IH), which are estimated to complicate up to 43% of OLTs . A multitude of anatomic and patient factors complicate the management of such hernias for the reconstructive surgeon. First, considering that OLTs are commonly performed through a “Mercedes-Benz” incision, most resultant IH have some combination of midline, subcostal, and flank components. Moreover, these defects typically abut bony prominences (costal margins and xiphoid), making the appropriate dissection for adequate mesh overlap challenging. Furthermore, OLT patients are subject to lifelong immunosuppression, which theoretically makes these patients more susceptible to wound complications, hernia recurrence, and mesh infection. Abdominal wall reconstructive techniques like the posterior component separation with transversus abdominis release (TAR) have been utilized in a variety of contexts including large flank defects and the repair of complex incisional hernias after kidney transplant with encouraging results [6, 7]. We hypothesized that the choice of a retromuscular repair with addition of TAR and dissection of the sub-xiphoid and subcostal spaces would be beneficial for the treatment of complex IH after OLT due to several reasons: (a) TAR provide wide mesh coverage in sublay position—isolated from the viscera and superficial wound morbidity—(b) possibility of reconstitution of linea alba under physiologic tension, and (c) wide mesh overlap of defects adjacent to bony prominences . Here, we report the experience of two high-volume centers using TAR for the repair of IH after OLT. After Institutional Review Board approval, OLT patients who had undergone an IH repair using the TAR technique were identified within the Americas Hernia Society Quality Collaborative database (AHSQC). These operations were performed by five different surgeons in two hernia centers in the United States. This analysis included only open, elective repairs using TAR. Minimally invasive repairs, open repairs performed through a different approach, or emergent IH repairs were excluded from this study. To underscore long-term complications like hernia recurrence, we have included only those patients with a minimum of 1-year follow-up reported. Patients’ demographic information, hernia characteristics, operative details, and surgical outcomes were abstracted from the AHSQC. The AHSQC is a hernia-specific nationwide registry with the objective of continuous quality improvement, accomplished through patient-centered data collection, ongoing performance feedback to clinicians, and improvement based on the analysis of collected data and collaborative learning. Data are collected prospectively, entered by the surgeon on a real-time basis during patient care. Patient demographics information, hernia-specific variables and operative details, as well as patient-reported outcomes (PROs) and postoperative, follow-up information are collected at each patient contact. Other details regarding the AHSQC and registry structure, governance, and data assurance process have been previously reported . Outcomes of interest included wound complications and hernia recurrence. Wound complications were reported according to the definitions summarized by Haskins et al. . Surgical site infections (SSI) were classified as superficial, deep, or organ space according to the Centers for Disease Control and Prevention classification (CDC) . Surgical site occurrences (SSO) include any SSI as well as wound cellulitis, non-healing incisional wound, fascial disruption, skin or soft-tissue ischemia, skin or soft-tissue necrosis, wound serous drainage, chronic sinus drainage, localized stab wound infection, seroma, hematoma, exposed mesh, or development of an enterocutaneous fistula . Surgical site occurrences requiring procedural intervention (SSOPI) is defined as any SSO that requires opening of the wound, wound debridement, suture excision, percutaneous drainage, or partial or complete mesh removal . Hernia recurrence was determined by physical examination, an abdominopelvic computed tomography (CT scan), or utilization of the validated Ventral Hernia Recurrence Inventory (VHRI) . A composite score was used, where any positive finding in one of the three components (physical exam, CT scan, or VHRI) is classified as a recurrence. For instances where there was discordance between recurrence assessment methods, the CT scan assessment was considered to be definitive. Medical complications, 30-day unplanned readmissions, reoperations, and mortality were also analyzed. Immunosuppressants in the perioperative period were managed by the transplant hepatologists from our institutions. In general, for those patients taking tacrolimus-based regimens, the treatment was continued during the entire perioperative period without interruptions or dose adjusting. For the patients using inhibitors of mammalian target of rapamycin (mTOR inhibitors), the medication was discontinued at least 6 weeks before the operation and patients were transitioned to tacrolimus. Similarly, tacrolimus was continued during the perioperative period, and mTOR inhibitors could be reintroduced 6–8 weeks after the hernia repair upon the discretion of the transplant hepatologists. All patients were under immunosuppressive medications at the time of surgery. The TAR technique has been extensively reported elsewhere [8, 14, 15, 16], but we will briefly summarize the key operative steps of TAR that are particularly important when addressing IH after OLT. Patients are operated under general anesthesia, in a supine position. Skin preparation and venous thromboembolism prophylaxis are done according to institutional protocols. All patients receive prophylactic antibiotics in a timely fashion. A generous midline laparotomy is performed (Fig. 1), followed by adhesiolysis and removal of previous intraperitoneal mesh. There is often significant scar tissue in the intersection of midline and subcostal defects. After incising the midline, we strategically initiate our retrorectus dissection avoiding these more scarred areas. Instead, we perform our retrorectus dissection below (1) and above (2) this intersection, following the surgical principle of “attack the easier areas first” (Fig. 2). The retrorectus space is accessed by incising the posterior rectus sheath. The retrorectus space is dissected laterally to the level of the linea semilunaris. Neurovascular bundles—encountered perforating the posterior rectus sheath just medial to the linea semilunaris—are identified and preserved. The posterior lamella of the internal oblique is incised just medial to the neurovascular bundles, exposing the medial aspect of the fibers of the transversus abdominis (TA) muscle. TA fibers are isolated with the aid of a right-angle clamp and divided. The intersection between the medial and subcostal components of the defect is again avoided, continuing the aforementioned dissection above and below this intersection. The TAR allows entering a preperitoneal plane in the lateral abdominal wall. Blunt dissection with a Kittner is then carried laterally and inferiorly until Psoas muscle is exposed. 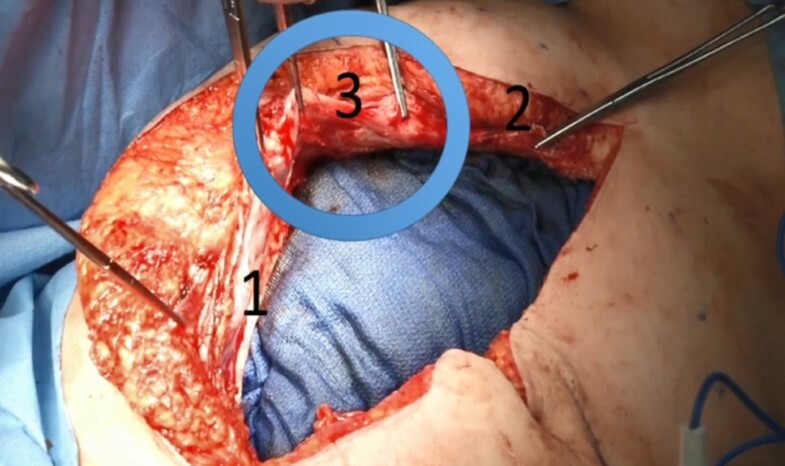 Ultimately, completing these dissections above and below the subcostal incision can allow the lateral preperitoneal plane to be matured beyond the defect (Fig. 3). Upon reaching the retroperitoneum above and below the defect’s intersection, we can now bluntly dissect the preperitoneal space of the defects intersection with our hands, from lateral to medial, thus joining the dissection planes. We found that using this approach facilitates the dissection and minimizes damage to the peritoneum. Finally, the posterior rectus sheath is incised at the intersection point between midline and subcostal defects (scared area), and the division of the posterior lamella of the internal oblique and TA fibers is performed, while the surgeon maintains his hands in the preperitoneal space (Fig. 4). Upon finishing this dissection, the surgeon is able to communicate the previously dissected planes. Caudally, dissection is carried into the space of Retzius, exposing Cooper’s ligaments and pubic symphysis. The lateral aspect of the pelvis is also exposed, deparietalizing cord structures or the round ligament. The cranial dissection into the retro-xiphoid space is the most important step in this repair, creating a large pocket to allow abundant mesh overlap underneath and beyond the costal margin, so it can adequately treat the sub-xiphoid and subcostal components of these hernias. Cranial dissection involves incising each insertion point of the posterior sheath into linea alba. By doing that, the retro-xiphoid space can be entered, encountering the fatty triangle that extends cephalad in a retrosternal plane; with such release, this plane becomes continuous with the retrorectus space. The plane between the fatty triangle and the xiphoid/sternum is further developed cranially. The last step is to connect the lateral preperitoneal plane that was developed after the TAR with the medial sub-xiphoid preperitoneal plane. At the most superior aspect of the posterior rectus sheath, TA fibers are thick and insert very medial, such that the muscle belly and associated aponeurosis does not fuse with the posterior lamella of the internal oblique. Essentially, at the most superior aspect of the TAR, working from lateral to medial, the “superficial” posterior rectus sheath is transected. This includes the posterior lamella of the internal oblique and muscle fibers of the TA. A layer of peritoneum will remain below the divided TA muscle which is attached to the medial sub-xiphoid peritoneum and lateral peritoneum. The most superior fibers of the TA are encountered just lateral to the xiphoid and divided, with great care not to inadvertently divide diaphragm fibers that merge with the TA fibers. With the aforementioned steps, the retrorectus and preperitoneal planes can be communicated across the midline. 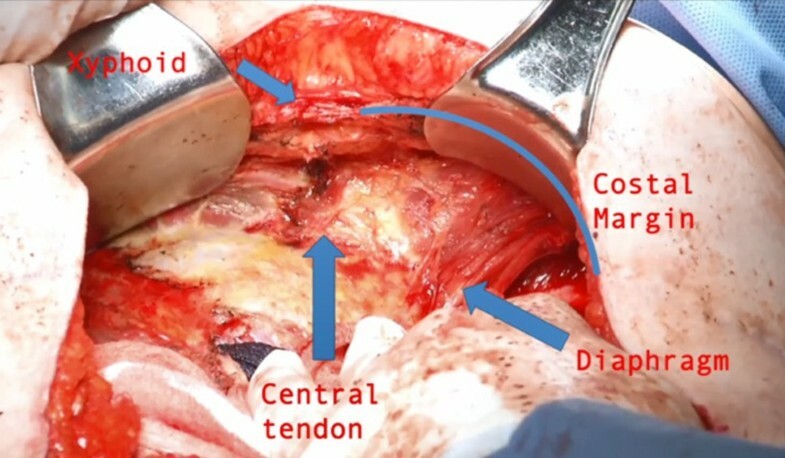 Finally, in the central area, a plane between the anterior diaphragm and the peritoneum can now be developed, sweeping the peritoneum down all the way to the central tendon of the diaphragm. The superior extent of this dissection is marked with the white tendinous portion of the central tendon of the diaphragm (Fig. 5). At the end of this dissection, the posterior elements can be re-approximated in the midline. After completing the dissection, the posterior rectus sheaths are re-approximated at the midline with a running 2−0 absorbable suture. A large-pore, uncoated piece of permanent synthetic mesh is placed in the retromuscular/preperitoneal position. The following meshes were used: Bard® Soft Mesh rectangular shaped 30.5 cm × 30.5 cm (0117016, C.R. Bard Inc., Warwick, RI), Prolene® Soft Polypropylene Mesh rectangular shaped 50 cm × 50 cm (Ethicon US, LLC., Cincinnati, OH), Bard® Mesh rectangular shaped 25 × 35.5 cm (0112660, C.R. Bard Inc., Warwick, RI), Prolene® Polypropylene Mesh square shaped 30 × 30 cm (Ethicon US, LLC., Cincinnati, OH), and Versatex™ Monofilament Polyester Mesh rectangular shaped 50 × 50 cm (VTX5050M, Covidien, Medtronic, Minneapolis, MN). At the center of the mesh, 4–5 cm from its most superior edge, the mesh is fixated around the xiphoid. This can be performed using a full-thickness transfascial suture that is placed with the aid of a suture passer. For such, the suture is placed in the mesh; a stab skin incision with a no.11 blade is performed from where the suture passer is inserted and retrieve each of the suture ends. Alternatively, a suture is placed as a mattress directly through the xiphoid process. Mesh is further fixated to each of the costal margins, at the level of the hemiclavicular line. For such, a monofilament absorbable suture is passed through the cartilaginous border of the rib, placed into the mesh, and returned into the cartilaginous border of the rib, in a U-stitch configuration. Mesh is further fixated circumferentially with the same full-thickness transfascial sutures, most commonly 3 on each side of the abdomen. Caudally, the mesh is fixated into the pelvis with one transfascial suture placed just above the pubis tucking the mesh into the space of Retzius. In two cases, no mesh fixation was performed (reflecting a change in the practice of one of the surgeons throughout the study period). Closed suction drains are placed on each side next to the mesh. Once fixation is finished, the anterior fascia is re-approximated in the midline with running or figure-of-eight slowly-absorbable monofilament suture. The subcutaneous space and skin are closed in layers with absorbable sutures, as well. Descriptive statistics were used to report data, using counts and percentages, mean, and standard deviations or medians and interquartile ranges as appropriate. We identified 57 patients who had undergone IH repair after OLT utilizing a TAR technique performed by the authors (JAB, DMK, SR, ASP, and MJR). Of those, 44 patients had a minimum of a 1-year follow-up and were included for analysis. Table 1 details patient characteristics. The mean age was 60 years (SD ± 8), 75% were male, and the median body mass index (BMI) was 30.7 kg/m2 [IQR 27–35]. The most frequent comorbidities were obesity (59%) and diabetes (34%), with the vast majority of patients (93%) being classified as ASA 3 (American Society of Anesthesiologists classification). Regarding hernia characteristics and operative details, Table 2 summarizes these findings. 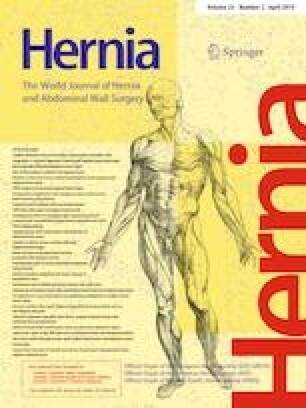 The median hernia width was 20 cm [IQR 15–28] with 75% of patients having both midline and lateral components. All but one patient had a clean wound status; this patient had a contaminated wound (CDC class 3) due to an open non-healing wound from a burn that was excised during the repair. Repairs were performed with uncoated permanent synthetic mesh, the most common of which were 43% medium-weight polypropylene and 41% heavy-weight polyester. Complete fascial closure (posterior and anterior fascia) was achieved in 41 patients (93%), and there were no intraoperative complications. Two patients had massive hernias with loss of domain (hernia widths of 28 and 34 cm, respectively) and neither the posterior or anterior elements were able to be completely closed. To permit closure of the posterior fascia, a piece of absorbable synthetic mesh (polyglactin 910-Vicryl®) was sewed to the fascial edges of the posterior rectus sheath, ensuring that intra-abdominal contents would be excluded from contact with the overlying permanent synthetic mesh. The anterior fascia was re-approximated in the midline to the greatest extent possible, and an area of bridging anterior fascia was left in the central portion of the abdomen. One remaining patient with a hernia width of 25 cm had the posterior fascia closed but a small central area of bridging in the anterior fascia. In this population, no concomitant procedures were performed during the hernia repair. Table 3 details short-term and medium-term outcomes. Patients were discharged after an average of 7 days (SD ± 5). There were 5 SSIs (11.4%), of which four were deep and one resulted in a mesh infection. SSIs were treated with wound opening (in 4 cases) and wound opening plus operative debridement in one case. The instance of mesh infection resolved with wound opening, debridement, antibiotics, and negative pressure therapy followed by wet-to-dry dressings, and, to date, has not required mesh removal (14 month follow-up). The remaining wound complications did not require procedural intervention with the exception of one large seroma that was treated with aspiration and drain placement. As such, the SSOPI rate was 13.6%, driven by the SSIs requiring wound opening. The 30-day unplanned readmissions rate was 9% (1 pneumonia, 1 symptomatic anemia without acute bleeding, and 2 SSIs) and three patients required reoperation (two due to postoperative bleeding and one due to the aforementioned deep SSI requiring debridement). There were no mortalities in this cohort. Recurrences details and assessment are detailed in Table 4. In-person assessments were performed in 36 patients (82%, 23/36 with CT scan and physical exam and 13/36 with physical exam only). The remaining 8 patients (18%) were assessed using exclusively the VHRI through a telephone interview. After a median follow-up of 13 months (IQR 12–17), the recurrence rate was 25%, mostly driven by central mesh fractures (CMF; 8/11). The mechanisms of two additional recurrences are currently unknown (patient-reported recurrence), and one was lateral to the previous repair. Recurrences dimensions have been generally small (Table 4) and seven have been repaired either through an open approach with onlay mesh or a laparoscopic approach with intraperitoneal onlay mesh (IPOM). Our study is the first to report the outcomes of TAR for the repair of IH after OLT. In a cohort of immunosuppressed individuals with complex IH, TAR with permanent synthetic mesh resulted in a 25% recurrence rate mainly caused by CMFs. There were 5 SSIs (11%) all of which were overcome with minor procedural interventions and antibiotics. In the only instance of mesh infection, wound opening and debridement followed by negative pressure therapy were successful in clearing the infection, and the mesh was not explanted. The remaining SSOPI was a sizeable symptomatic seroma treated with percutaneous drainage, and the other SSOs were of minimal clinical significance, not requiring procedural interventions. Although TAR in this setting is technically feasible and results in acceptable wound morbidity rates, the recurrence rate driven by CMF is definitely concerning; therefore, mesh selection needs to be re-evaluated, and further reports from the other centers with larger number of patients might help to determine the role of TAR in this challenging subset of patients with IH. A multitude of factors have contributed to increasing survival of OLT patients in the last decades, namely advancements in surgical techniques, perioperative care, and immunosuppressive regimens. Ayloo et al. reported that, over the past 20 years, graft loss rates had decreased by 34%, while overall survival has increased by 33% after adjustment for multiple confounders. As such, it is now estimated that in the United States, overall survival rates after 1, 3, and 5 years of OLT are 87.4%, 79.4%, and 59.8%, respectively . Considering that survival rates are increasing, it is estimated that 5–40% of patients undergoing an OLT will develop and incisional hernia; it is likely that the management of incisional hernias after OLT will become a frequent encounter for general surgeons. IH are estimated to complicate up to 43% of OLTs, often resulting in impairment in quality of life and need for subsequent surgery . Several studies have investigated the incidence and risk factors for IH formation after OLT [18, 19]. Among the identified risk factors, SSI, advanced age, re-laparotomies, increased BMI, and prolonged ICU stay were the most frequently reported [5, 18, 19, 20, 21]. Ultimately, those risk factors are non-modifiable and, similarly, predict hernia formation in the general population. Among modifiable risk factors, some authors reported that the Mercedes-Benz incisions are associated with the higher rates of wound complications and hernia formation, and, therefore, advocate the use of a J-Shaped [18, 22] or bilateral subcostal incisions [23, 24]. The OLT patient with a complex IH presents a multifaceted challenge for the reconstructive surgeon. First, anatomical factors such as the combination of midline and subcostal defects and the proximity to the costal margin and xiphoid process make retromuscular dissection difficult, and can limit mesh overlap in both open and laparoscopic approaches, ultimately leaving the patient susceptible to recurrence. 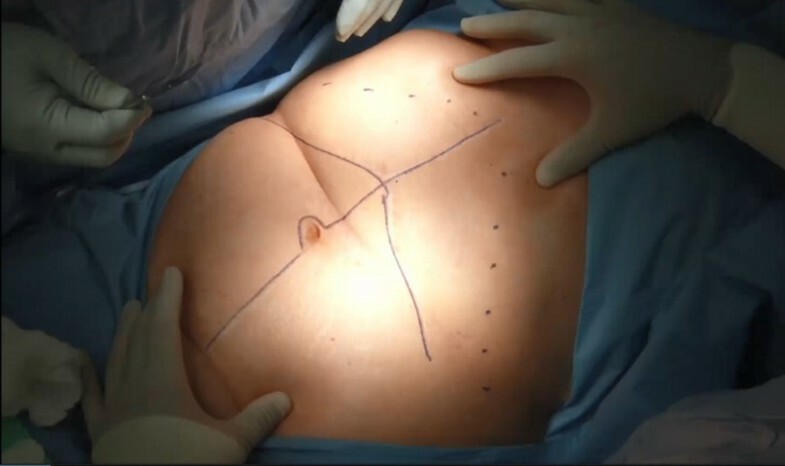 While it is well known that smaller incisional hernias after OLT can be adequately repaired through a minimally invasive approach [25, 26, 27, 28, 29] that yields low wound complication rates, many OLT patients present with large or Swiss cheese defects requiring abdominal wall reconstruction (AWR) through an open approach. 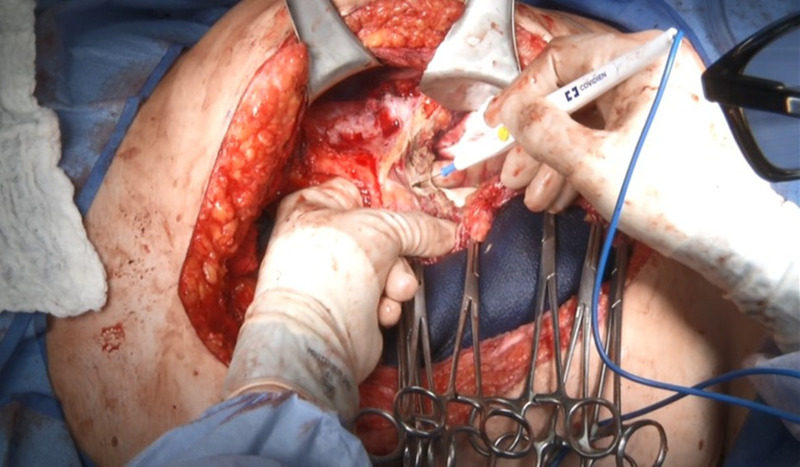 Furthermore, the laparoscopic repair of hernias extending to the xiphoid and costal margins is challenging as mechanical mesh fixation cranial into the diaphragmatic surface is not recommended due to the risk of chronic pain or pericardial injuries . Therefore, the inherent combination of open incision, extensive dissection, and permanent synthetic mesh placement used for AWR poses significant concerns for surgeons, as serious infectious complications can be devastating in a lifelong immunosuppressed patient. Another genuine concern is that some immunosuppressive medications are associated with poor or delayed wound healing  and, therefore, could result in expectant recurrence. We have hypothesized that several characteristics and technical aspects of TAR would be particularly beneficial in this specific population, and would result in superior results when compared to other open repairs. First, the TAR allows for the mesh placement in a well-vascularized retromuscular space, favoring mesh incorporation and protection from both intra-abdominal contents and superficial wound morbidity. Similarly, TAR precludes dissection of subcutaneous flaps and, therefore, reduces skin undermining contributing to avoid wound complications related to de-vascularization of the skin and subcutaneous tissue. Another important technical aspect of this operation is the ability to dissect the sub-xiphoid space in a preperitoneal plane. As such, the preperitoneal plane in the lateral abdominal wall, the retromuscular plane in the anterior abdominal wall, and the retro-xiphoid space communicate, creating a large compartment for mesh with extensive overlap beyond and xiphoid and costal margins. As such, hernias located near these structures can be repaired with adequate reinforcement to diminish the likelihood of recurrence. Finally, TAR has the ability to extend the dissection into the preperitoneal space of the lateral abdominal wall all the way into the retroperitoneum, providing wide lateral overlap, as well. In contrast, the traditional retromuscular repair (Rives–Stoppa) restricts mesh reinforcement to the retromuscular compartment and, therefore, has limited ability to treat such hernias . From a technical standpoint, some could argue why we elected to use a midline incision instead of reopening the prior Mercedes-Benz incision. The reasons for using a midline incision are multiple. First, a midline component was present in all of the incisional hernias of our study population. Therefore, using a midline incision, we could easily address the most frequent component of the hernias. Second, the authors are very experienced in the midline approach of complex ventral hernias using a posterior component separation approach, and given the added complexity of this group, we have favored what we are most comfortable with. Finally, the midline incision provides direct access to the retromuscular space, and importantly allows the surgeon to directly visualize the intercostals bundles. If the repair is performed through the subcostal approach, we have often found in our flank hernia repairs that the intercostals nerves often cannot be directly visualized and are at increased risk for sacrificing. In fact, in this group of patients with already bilateral subcostal incisions and some of the intercostals nerves by necessity transected, we feel that it is even more important to try and salvage as many intercostals nerves as possible to avoid denervated and bulging rectus muscles below the Mercedes-Benz incision. In rare cases with very lateral and midline defects, we can consider extending the subcostal incision to be included with our midline incision. As long as skin flaps are not created, the blood supply of the superior and inferior flaps should be maintained. The use of TAR for the treatment of complex IH after kidney transplant has been previously reported by Petro et al. . While using either permanent synthetic or biologic mesh, the authors reported an SSI rate of 18% (all superficial and managed with antibiotics only) and a recurrence rate of 9% (mean follow-up 13 months). In our analysis, the SSI rate was lower (11.4%), but consisted of more deep SSIs. Nevertheless, there was one instance of mesh infection that was treated without mesh removal. Considering that our study involved a vast majority of clean cases, some could argue that this rate is higher than expected for TAR performed in a clean wound. For example, Winder et al. reported an SSI rate of 5.4% among 37 patients undergoing TAR from which 90% had a clean wound status. Indeed, much of the published outcomes of TAR report SSIs for all wound classes combined and, therefore, there is a lack of data assessing the SSI rates for TAR particularly in a clean wound. The unpublished data from our institution estimate that the overall SSI rate of TAR in clean wounds (for hernias of similar dimensions as those in our study—interquartile range 15–28 cm) is 7.2%. One explanation for the higher SSI rate could be the use of immunosuppression. Indeed, a propensity-matched analysis by Haskins et al. found that immunosuppressed patients undergoing open ventral hernia repair with a clean wound had the higher rates of SSO but not SSI, SSOPI, and other complications. Ultimately, while the SSI rates appear to be high in this scenario, the complexity of patients in our cohort should be emphasized: 60% obese and 34% diabetics, with a median defect width of 20 cm. Therefore, as our study is the first to report the outcomes of TAR in this specific population, further data from the other institutions are necessary to allow for comparisons and generate meaningful conclusions. Unfortunately, a 25% recurrence rate was identified in our study, and 8/11 (73%) recurrences have been the consequence of CMFs. The phenomenon of CMF (or central mesh failures) has been previously reported by many authors [35, 36, 37, 38, 39, 40]. In 2001, Langer et al. reported a recurrence due to central mesh fracture of Marlex mesh placed as a sublay. In this report, the authors hypothesized that the lack of anterior fascial closure (bridged repair) resulted in a central area of stiff unincorporated mesh that suffered different stress than the lateral well-incorporated portions of the mesh. Nearly 16 years later and after several case reports of polypropylene central mesh fractures, Warren et al. published their investigation on the patterns of recurrence and mechanisms of mesh failure for open hernia repairs performed at their institution . Surprisingly, 40% of the identified hernia recurrences were attributable to central mesh fractures. Indeed, the authors found that recurrences occurred more frequently in light-weight polypropylene meshes (21% vs. 8% with medium-weight polypropylene), a factor that led them to abandon the use of light-weight material. Specifically, in TARs, Novitsky  reported five recurrences due to CMF (1 in medium-weight polypropylene, one in multifilament polyester, and three in monofilament polyester). In our study, follow-up imaging studies identified eight CMFs (two on medium-weight polypropylene and six on heavy-weight monofilament polyester mesh). These findings are similar to those reported by Petro et al. who reported a 22% recurrence rate with the use of light-weight polyester mesh in sublay position from which over 87% were due to mesh fractures. In contrast to the previous reports, all the patients in Petro’s study had complete fascial closure during the operation, suggesting that factors other than the lack of closure of the anterior fascia might be involved in the genesis of central mesh fractures. So far, CMFs have been reported in the meshes of different weight and material compositions and when placed in different positions; nevertheless, they appear to be more frequent in polyester-based meshes. While the reasons for this remains unclear, the manufacturer of the heavy-weight polyester mesh used in some patients in this study (Versatex™ Monofilament Mesh, Medtronic, Minneapolis, MN) has notified the U.S. Food & Drug Administration (FDA) who issued a Class 2 device recall . The stated reason for the recall is, “There have been patient reports of abdominal hernia recurrence following hernia repair. The recalling firm has added a statement to the device’s Instructions for Use to make surgeons aware of risks in using the device in Transversus Abdominis Muscle Release (TAR) procedures”. It should be noted that our mesh selection for such cases was not based on the specific material but on the uniquely large dimensions of that heavy-weight monofilament polyester prosthetic for which at the time there was no polypropylene equivalent. We preferred to use the Versatex™ mesh as it was the only uncoated heavy-weight synthetic mesh that had a 50 × 50 cm version available. When repairing hernias of large dimensions, it is a common practice to sew two pieces of mesh of 30 × 30 cm polypropylene mesh together using monofilament polypropylene sutures. Although rare, some patients might develop chronic sinus tracts due to one of these sutures and this was a concern for us in immunosuppressed patients. Therefore, we elected to use the 50 × 50 cm polyester mesh as a way to avoid this potential complication. After the present recurrences were detected, we have abandoned the use of such mesh and we now have available a 50 × 50 cm piece of medium-weight polypropylene mesh (Prolene® Soft Polypropylene Mesh rectangular shaped 50 cmx50 cm (Ethicon US, LLC., Cincinnati, OH), which is our current mesh choice for such cases. It is important to note that longer term follow-up of patients receiving different mesh types (i.e., material, weight) will provide further insight regarding the ideal mesh choice for TAR patients in this context. Importantly, experience from the other surgeons/centers is also necessary to arrange for meaningful conclusions about proper mesh selection and outcomes of TAR in this challenging patient population. Our study has limitations that deserve mention. First, it is a review of prospectively collected surgeon-entered data and some could argue that it still carries all the inconveniences of a retrospective study. Second, our study population is limited to a subset of patients with IH after OLT that were large and complex enough to warrant an open abdominal wall reconstruction. In addition, operations were performed by a small number of surgeons with extensive experience in TAR. Such factors suggest that our results are not comparable to the results of the other series reporting the outcomes of open or minimally invasive repairs of IH after OLT. As previously mentioned, recurrence rates due to CMF are concerning and demand further investigation. Of utmost importance is to mention that factors other than a specific mesh material might be involved in the genesis of CMF, since these phenomena have been previously reported in different mesh compositions. In addition, 8 out of the 44 patients (18%) had the recurrence assessment done exclusively by means of the VHRI. From those, 6 denied having a recurrence and 2 reported to feel or see a bulge and, therefore, were classified as recurrences. Although all patients reporting positive answers to the questionnaire were considered a recurrence, we acknowledge that the lack of an imaging evaluation to detect small CMFs in those patients might contribute to underestimating the real recurrence rate in our cohort. Finally, our median follow-up is 13 months; longer term follow-up is also needed to determine the repair durability in all the patients. 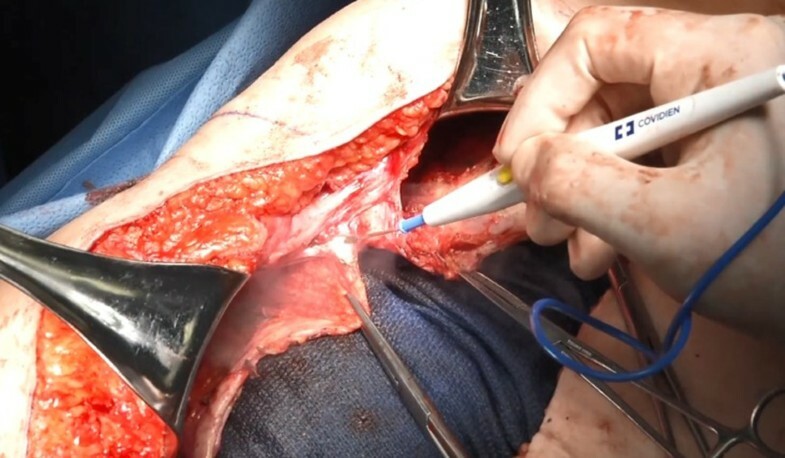 TAR with permanent synthetic mesh is technically feasible and successfully addresses many of the anatomical challenges of repairing IH following OLT. Wound morbidity rates and outcomes are acceptable, with the management of most SSIs being limited to simple bedside procedural interventions. As recurrence rates in our cohort were mostly driven by CMF, further studies reporting the outcomes of TAR performed by the other institutions and with different mesh selection are necessary to determine the role of TAR for the management of complex IH after OLT. LT and AF declare resident research grants from the AHSQC that are not related to the submitted work. JAB has received: grants from the Americas Hernia Society, Intuitive Surgical Inc., and Colorado Therapeutics and personal fees from Colorado Therapeutics, Bard Davol Inc., Medtronic Inc., Intuitive Surgical Inc., and Cook Biomedical. None of these conflicts of interest are related to the submitted work. DMK has received an educational grant from W.L Gore that is not related to the submitted work. ASP has received a research grant from Intuitive Inc. and personal fees from Intuitive Inc. and Medtronic Inc. that are not related to the submitted work. MJR declares to receive salary support from the AHSQC, research grants from Intuitive Inc. and Pacira Pharmaceuticals Inc., and to be a board member and have stock options from Ariste Medical; none of these conflicts of interest are related to the submitted work. CCP, HA, MS, and SR declare no conflicts of interest. This study was approved by the local Institution Review Boards (IRB) from both participating institutions. This study does not contain any studies with participants or animals performed by any of the authors.